The Indian coffee sector is at an important transition point, increasingly stuck in the middle between quality and value segments of the market. 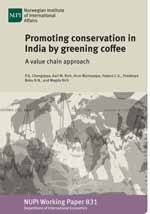 A potential niche for India is in the development of eco- friendly (green) coffees, leveraging the natural environment and biodiversity present in many regions. In this study, we conducted a value chain assessment of the coffee sector in Coorg, a major production area in India, to identify the potential entry points and constraints to a conservation-oriented strategy of upgrading. Our results highlight that coffee value chains in Coorg are fragmented and largely uncoordinated, with innovative upgrading efforts largely individually motivated. This suggests that integrating conservation principles in a broad-based branding strategy could be difficult at the level of the chain without institutional support or the entry of chain champions. On the other hand, integrating conservation as a diversification activity e.g. through the development of butterfly gardens for tourism, could provide a low-cost way of adding value for farmers while promoting good environmental stewardship.